Why sacrifice function for beauty. For an stylish solution to your storage and serving needs, look no further than the Avalon it has extra large rectangular storage ottoman. The unit is made from durable slate grey linen type fabric and comes with three flip over serving trays and lots of storage space. 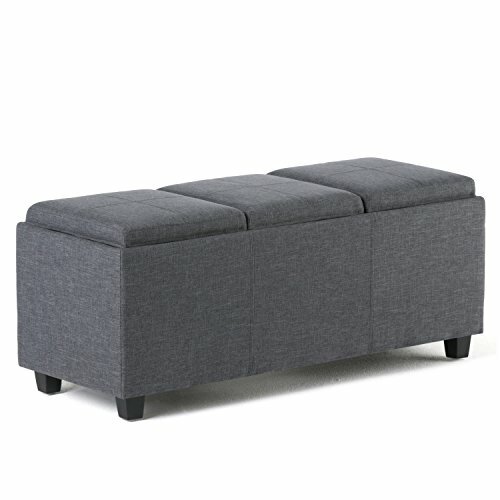 This attractive ottoman is extra strong and durable and features a beautiful stitched exterior and large storage interior. Whether you use this ottoman in your entryway, living room, family room, basement or bedroom, it will allow you to hide away all that mess and eat your food in comfort. This ottoman is available in brown, black, red, cream and green PU plus natural and grey linen type fabric.